Alice Jordon was a typical "Friday's child" for she was "loving and giving," especially where her sister Gwenn, vain, selfish and clever, was concerned. Another "Friday's child" in the huge Jordon family was the eldest sister, Jenifer. Jenifer held the family together and Alice, happy, completely unself-conscious, was her able lieutenant. General Jordon's headquarters are now at Fort Jay, on Governor's Island, within a stone's throw of the Statue of Liberty. Since the Parrishes (minus Penny and David) live there too, it is only natural that the young people of both families should meet--even though Gwenn resists every opportunity to put her best foot forward and be the least bit friendly. When Gwenn, uninvited, follows Jenifer to the Camp Illumination at West Point, it is faithful Alice who loyally trots off to bring her back to the island. But it is patient Jenifer who in the end must decide just what to do about the Jordon family's prima donna. So you can see, there is never a dull moment at the Jordons', especially with the Parrishes on hand. And just to top if off Cyril, Lord Carlington, to the delight of Jenifer, returns from England for what could possibly a very long stay. True confession: It took reading this book and thinking a bit more deeply about it to realize that the cover illustration is probably supposed to be Alice. I've always thought it was Gwenn, cause she looks super pouty and RBFish. Anyhoo! On to the second in the Jordon family series! And in this one, the Jordon and Parrish families begin to intertwine. We open with Alice and Gwenn at the pool on Governors Island and making their first overtures to the gang that hang out with Tippy and Bobby Parrish. Alice is all ready to be friends, but Gwenn hurries her away, too insecure to reach out to make friends. Hence, the conflict. Alice is steadfastly loyal to Gwenn, who does not return the affection. Jenifer steps in to try to get Gwenn to behave civilly. She flat out calls Gwenn a 'neurotic', which is a perfect description. As the book progresses, Alice struggles between making new friends and a life for herself with her devotion to her troublesome sister Gwenn. Alice gets pulled into a swimming race between her and Bobby, and Gwenn connives to keep Bobby from the race, which only serves to worry Alice that she's jeopardized her friendship with the gang. Despite the shenanigans, Gwenn manages to get herself invited along with Alice to Tippy's sister Penny's play and out for lunch, where we learn that Penny has husband Josh and a baby daughter, who is three months old and named Parrish MacDonald. In other news, Cyril writes to Jenifer and asks that she come back to England to visit him when his Aunt Kate comes over to visit. Jenifer get a little overwhelmed by this offer and by his loneliness, on top of the rest of her responsibilities. "Never in all their lives had they seen Jenifer show any sign of discouragement. She carried problems on her strong young shoulders like Pilgrim, and when they were too heavy to carry she dragged them off somewhere where no one ever saw them again. Now her shoulders sagged and they began to suspect that all their lost problems were locked up somewhere inside her." A respite comes when Jenifer is invited up to West Point for a dance, and finds out it is Camp Illumination weekend. "'Camp Illumination, pet. It's one of the biggest things the cadets have. The whole summer camp of tents is lighted up with strings of lights and lanterns, and it's the only time girls are allowed to walk along the rows and go into the tents and talk with everyone. And after, you mark in a parade to the field house for the dance.'" Gwenn and the whole family get Jenifer ready for this exciting weekend, despite the fact that Gwenn is sad that she is too young to go along. Jenifer leaves, Alice is worried and rightly so, because, of course, Gwenn has run off to West Point. Gwenn takes a bus, gets a hotel room and calls out a homely cadet, who naturally asks her to the dance. Meanwhile, poor Alice has smashed all the family's piggy banks in order to get money to go get Gwenn at West Point. She drags her back, where it's decided that Gwenn will go to boarding school. Alice, encouraged by Bobby, decides to put her foot down and not go with Gwenn. Alice and Gwenn are invited out to Penny Parrish's house (Round Tree Farm), where they meet Carrol Parrish. "Carrol Parrish answered the wave and ran across the grass to meet them. Her eyes were gentian blue and her pale hair was tied on her neck with a black velvet ribbon, strained away from features that were so beautifully modeled they needed no curls to frame them." Was there ever a character as beautiful as Carrol? Knowing Gwenn's interest in dancing on the stage, Penny has invited a dance teacher out to the Farm and Gwenn dances for her. Soon, plans for dancing lessons ensue and the boarding school idea is discarded. Gwenn finds out that Jenifer set the whole thing up, visit to Penny's, dancing teacher, and for a moment, Gwenn is appreciative. For a moment. Aunt Kate and Cyril are sailing into town and Jenifer goes to the docks for the long-awaited meeting. "She craned and peered, shading her eyes with her hand, until a voice behind her called, 'Oh, I say!' And there he was. They were crushed together in the center of a milling mass and her only thought was how good he smelled, of fresh sea air and pipe tobacco. He held her against his chest until she wondered if he kept her there or if her hands locked around his neck supported her." Cyril has come back to ask Jenifer to marry him, but she can't--she has too much family to take care of. But it sounds lovely. "Jenifer closed her eyes. Oh, to be taken care of, she thought. To have someone who will think of me first, after all the years I've spent planning for others. It was a beautiful dream and she held it close for a moment, then lifted her head." "Alice was a happy little motor boat loose in the harbor. She raced up and down and in and out, not so graceful as Gwenn but covering more ground, and boys tapped Bobby so often and with such a solid grasp that his white shoulder was soiled." 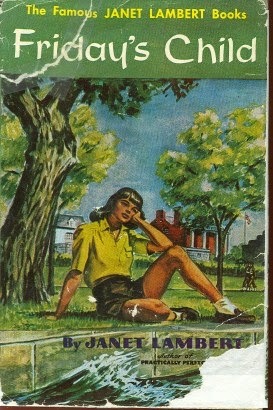 The end of the book appears to be the start of something else, as Bobby offers to drive Alice to school when it starts. Exciting! Again, this one is not a particular favorite of mine. I feel bad for poor Alice having to deal with neurotic, high-strung Gwenn, although she develops a spine. However, it is fun to see the start of the Jordon-Parrish intersection, which weaves together like a very complex spider's web.